Officials from Yemen’s internationally-recognized government are set to hold direct talks with Houthi rebels in Sweden on Thursday in the most significant step to end the country’s conflict in more than two years. The UN-sponsored talks come amid growing international pressure for a ceasefire as the humanitarian crisis worsens in the country after more than three years of war. As many as 14 million Yemenis are suffering severe food shortages, aid agencies say, while an estimated 85,000 children under the age of 5 may have already died of starvation, according to Save the Children. The Yemeni Houthi delegation arrived in Sweden late Tuesday for the talks, along with the UN’s special envoy to Yemen, Martin Griffiths, whose diplomacy has helped bring the warring parties together. Earlier, Swedish Foreign Minister Margot Wallström confirmed that Kuwait mediators had arrived. Kuwait hosted the last direct peace talks in 2016, which failed after Houthi rebels rejected a UN proposal aimed at ending the war. Yemeni government officials left the discussions shortly afterward. A delegation from Yemen’s Saudi-backed government was due to arrive in Sweden on Wednesday, according to the Minister of Information Moammar al-Eryani. “The delegation is carrying the hopes of the Yemeni people to achieve sustainable peace based on the three references,” Abdullah Alalimi, the head of the presidential office and delegation member posted on Twitter. Both warring parties — the Iranian-backed Houthis and the Yemeni forces supported by Saudi Arabia and the United Arab Emirates — have made overtures to one another ahead of the talks. Yemeni Foreign Minister Khalid al-Yamani said in a statement Tuesday that the two sides have reached an agreement on a prisoner swap. He added that the Sweden talks would tackle the implementation of the exchange. 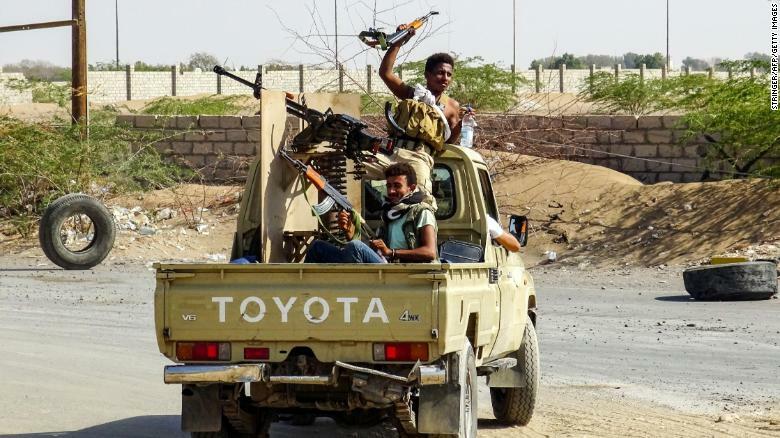 Pro-government forces cheer in the back of a pickup mounted with a machine gun outside Hodeidah. This week, the Saudi and Emirati-led coalition temporarily eased its blockade on the country to allow a plane carrying 50 wounded rebels to fly to Oman’s capital for medical treatment. In November, Houthi leader Mohammed Ali al-Houthi called on rebel forces to cease missile and drone strikes against coalition positions at the request of the United Nations. The discussions in Sweden would almost meet a 30-day deadline set by US Defense Secretary James Mattis in October for face-to-face talks. 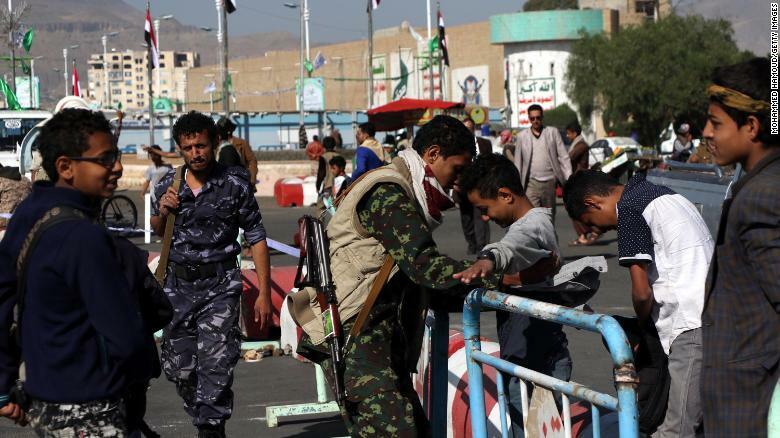 Houthi fighters check people entering a square for a rally last month in Sanaa. “Thirty days from now we want to see everybody around a peace table based on a ceasefire, based on a pullback from the border and then based on ceasing dropping of bombs that will permit the special envoy … to get them together in Sweden and end this war,” Mattis said October 30 at the US Institute of Peace in Washington. But last month, the United States “slammed the brakes on” a UN Security Council resolution calling for a limited ceasefire and increased humanitarian aid in Yemen over concerns about angering Saudi Arabia, two sources told CNN. The draft resolution, crafted by the UK, called for a ceasefire only in Hodeidah, the principal Red Sea port through which some 80% of humanitarian aid flows. Western leaders have been increasingly critical of the Saudi-led coalition’s role in Yemen’s war amid the global fallout over the October 2 killing of journalist Jamal Khashoggi at the Saudi Consulate in Istanbul. Calls among Western countries for a ceasefire in Yemen have grown. Germany suspended lucrative arms deals with the kingdom last month, and Denmark and Finland have since followed suit. The Yemen conflict began after Houthi rebels took over Sanaa in August 2014 and escalated after a Saudi and Emirati-led intervention in March 2015. The war has claimed more than 10,000 lives and sparked, what the United Nations has called, “the world’s worst humanitarian crisis.” The country is also home to the world’s worst famine in 100 years, according to the United Nations.